Computation in Toronto is located at 280 Jane Street. We are a few blocks North of Bloor St. West and just South of Annette, steps to the heart of Bloor West Village — steps from Jane subway station, and 10 minutes walking on Bloor Street West from High Park, or 5 minutes east of the Humber River. Parking is available on the street, and at the rear of the building directly behind the shop. Approaching westbound Exit onto the South Kingsway and proceed north to Bloor Street, turn right onto Bloor, and then a left on Jane Street. Proceed North on Jane Street, just past Ardagh St. Approaching southbound on Highway 400, or westbound on Highway 401. Exit onto Black Creek Drive and proceed to the Jane Street exit, and continue south towards Annette St. Approaching eastbound on the QEW/Gardiner Expressway. Exit onto Lake Shore Boulevard West proceed to Windermere Avenue and turn left/north. Continue north to Bloor Street West. 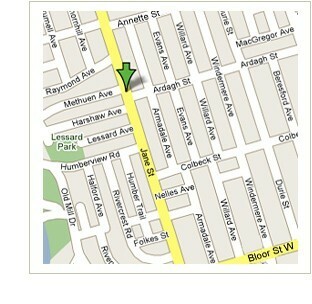 Turn left onto Bloor, and proceed towards Jane Street – turn right on Jane Street and proceed North bound just past Ardagh St.